Photo Caption: Dr. R. A. Badwe, Director, TMC, discussing the TMC model as part of the session on ‘Sustainable models of Health Institutions’ at the 75th anniversary of the Tata Memorial Centre at the Tata Institute of Fundamental Research, Mumbai on Friday. 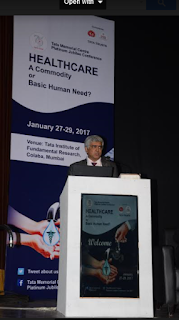 January 27, 2017: Dr. Rajendra Badwe, Director, Tata Memorial Centre, inaugurated a 3-day healthcare conference today, held to mark the institution’s platinum jubilee, at the Tata Institute of Fundamental Research, Mumbai. The conference, themed “Healthcare: A Commodity or Basic Human Need?”, brings together National and International representatives of health systems across the world, to address this very relevant question. Day one of the conference brought together leading health experts from Brazil, Thailand, Zambia, Japan, Iran, France and Cuba, who shared examples of their country’s health systems and efforts to achieve universal health coverage. The various opportunities and challenges for a country on the road to UHC were discussed and deliberated, a discussion that has enormous national implications for India, in its journey to achieve the SDG goal of universal health coverage by 2030. Tata Memorial Centre is the premier cancer care facility in India which has been at the forefront in the fight against cancer since the past 75 years. The mandate and objective of the centre is to provide comprehensive care in the field of cancer which includes Education, Awareness, Prevention, Treatment, Rehabilitation and Palliation etc. Approximately 200 new cases everyday come from all over India and also from outside the country. Tata Memorial Hospital is a Grant in Aid Institution under the Dept. of Atomic Energy, Govt. of India and it treats 60% of the cancer patients almost free of charge.